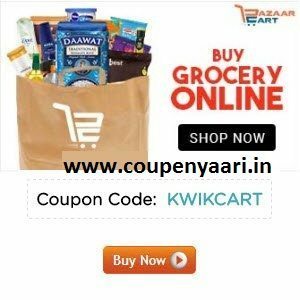 Use code KWIKCART to get 25% MobiKwik cashback on BazaarCart. Maximum MobiKwik cashback is Rs 50. Offer valid on a minimum transaction of Rs. 199. Offer valid till 30th April, 2016. Also, earn assured PAYBACK loyalty points on all transactions done via MobiKwik wallet. MobiKwik is the ONLY wallet which helps you convert your PAYBACK points into money with a simple 2-click process. On Merchants: Spend between Rs.200 and Rs.299, earn 2PAYBACK points. For every Rs.100 spent between Rs.300 and Rs.499, earn 1 additional PAYBACK point.